Do you want something a little more unique than just a normal rectangular window? Then architectural windows might be the best option for you. There’s no denying the charm and style that they’ll bring to your home. You’re probably wondering what’s an architectural window? Architectural windows are inoperable windows that come in different shapes. There are square, triangle, octagon, circle and semicircle options available. Now that you know what architectural windows are, it’s time to learn why they’re a great option for your Madison home. Below, there are just a couple of example on why you should consider architectural windows for your home. As we mentioned above, architectural windows come in many different unique shapes. These shapes offers a different style and look for your home that you won’t get with other window styles. The great thing about architectural windows is that they can be installed anywhere in your home and pair with any other window style – they’re extremely versatile. Whether they’re the only window in a room or they’re installed above a large double hung window, you can’t go wrong with architectural windows. We do recommend that you pair an architectural window with an operable window like a casement or sliding window. This is because architectural windows don’t open so if you want more air flow in the room, you’re going to need an operable window. 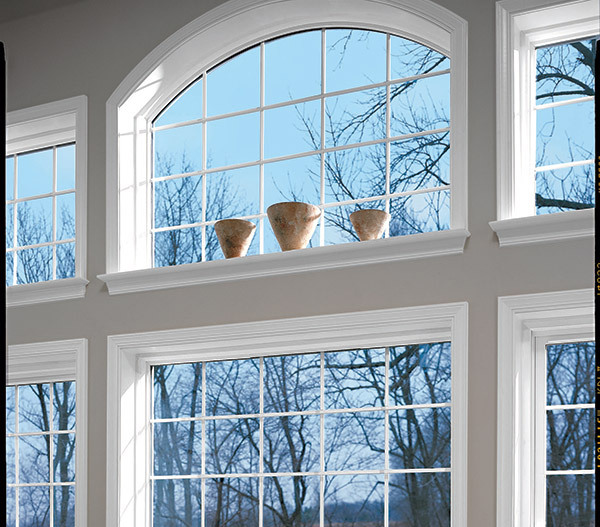 Vinyl architectural windows, like the ones you’ll get at Feldco, are extremely energy efficient for multiple reasons. They’re made up of double pane, argon gas-filled glass and have foam insulated frames. This creates an air tight seal that prevents heated and cooled air from escaping your home. Why is this important? When you trap heated and cooled air in your home, your furnace and air conditioner won’t have to work as hard to reach your desired temperature. That means they’re using less power and you won’t have to spend as much money on your energy bills. It doesn’t matter how great your architectural windows are if they’re not installed properly. That’s where Feldco comes in. All of our windows are installed by factory trained and certified professionals, ensure that the job is done correctly and your windows look great. If you need new architectural windows for your home, get a free quote now. It has never been easier to get replacement windows for your home.